Should Your Brand Be on These Popular Asian Social Channels? With a population of 4.3 billion, Asia represents a booming audience that enterprise brands are continually trying to engage. Out of the latest 100 million users to join Instagram, more than half resided in Asia or Europe, with Indonesia and Japan as two of the top three countries that gained the most users. As of March 2014, India’s Facebook user base was nearing 100 million. In early 2015, eMarker predicted that Japan would reach 26 million Twitter users. Social media’s growth throughout Asia isn’t slowing down. But some of the region’s governments block access or censor portions of mainstream social networks, providing unforeseen challenges for global brands. These restrictions contributed to a rise in smaller, Asia-based social channels. 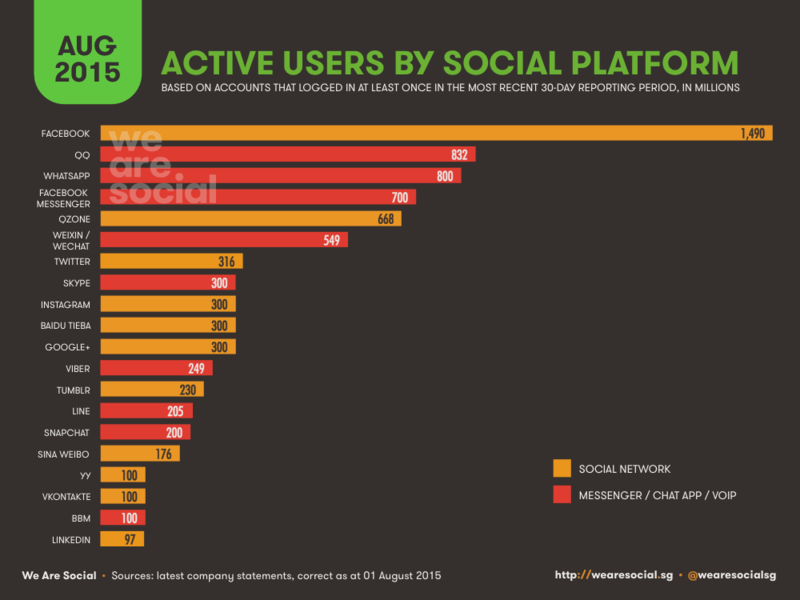 We Are Social’s latest Global Digital Statshot analyzed social channels with the most active users. The data highlights how many Asia-based networks, such as QQ, QZone and WeChat, command a sizable, regional audience. To reach your demographic on social in Asia, it’s essential to understand what channels residents are engaging in. Learn how these channels can be incorporated into your organization’s international social media activities to better support your brand’s existing, mainstream platforms. The conglomerate Tencent owns WeChat as well as other online products and Chinese social media sites, such as Qzone, QQ and Tencent Weibo. Similar to WhatsApp or Line, WeChat is a Chinese messaging app with 650 million monthly active users. Unlike other messaging and calling apps, WeChat provides users with a suite of everyday mobile solutions, from booking a doctor’s appointment to sending sticker messages to a friend. With 200 million users’ credit cards connected to it, the platform is best known for its integration as a powerful payment platform supporting offline transactions, bill paying and peer-to-peer money transferring. It’s too early to say if the payment feature will be a long-term success, but it is one of the reasons why Snapchat, Facebook and other social networks are testing payment options on their platforms. While brands can pay to advertise on WeChat, they stand to gain additional value by using WeChat as a means of having a one-to-one dialogue with their audiences, similar to text messaging. Burberry drove engagement around its 2014 fashion show by giving WeChat users behind-the-scenes access to the event, audio commentary from the brand’s creative team and communication with popular Chinese celebrities through texting. With 644 million monthly active users, Qzone is a blogging and social media hybrid that’s regarded as one of the older siblings of WeChat. Qzone’s size and coverage of the Chinese marketplace are two main benefits for global brands looking to invest in the channel. Compared to WeChat, which is a closed and private network used among friends, Qzone is built on relationships with acquaintances and public sharing. On Qzone, users blog, listen to music and send photos from personal microsites. The social channel is integrated with QQ, a regionally popular social networking and gaming platform similar to Facebook. Users can sync their QQ pages with their Qzone microsites and share content through both platforms, providing more potential reach for brand content and messaging. The platform is highly customizable to brands. The microsite functionality makes it easy for brands to match a specific campaign’s goals and reach a target audience. Examples of global brands using Qzone include Nestlé, which tapped into the platform’s customizable features to promote its BenNaNa ice cream, and Oreo, which has invested in ongoing activity by sharing videos, images, games and other media to engage its audience. Often compared to Twitter, Weibo is a China-based social network. The channel has 212 million monthly active users in 190 countries. Brands willing to invest in Weibo have access to its existing, high-profile partnerships. In addition to its collaboration with Alibaba—the Chinese ecommerce giant that allows people to shop online through their accounts—the channel has relationships with TV and movie industries in Asia. The platform sells advertising space and monetizes its business through social gaming, paid content and other revenue sources. Compared to traditional mediums, such as TV, advertising on Weibo is affordable. The network also focuses heavily on encouraging users and influencers to create content around niche topics—a strategy that attracts advertisers, who can then target ads around these exchanges. Durex, the condom brand, has been using Weibo to increase its market share and generate revenue in the Asian market successfully since 2012. The brand partnered with key influencers in the entertainment industry to grow its audience, advertised on the channel and reduced distribution costs by selling product directly from Weibo’s integration with Alibaba. 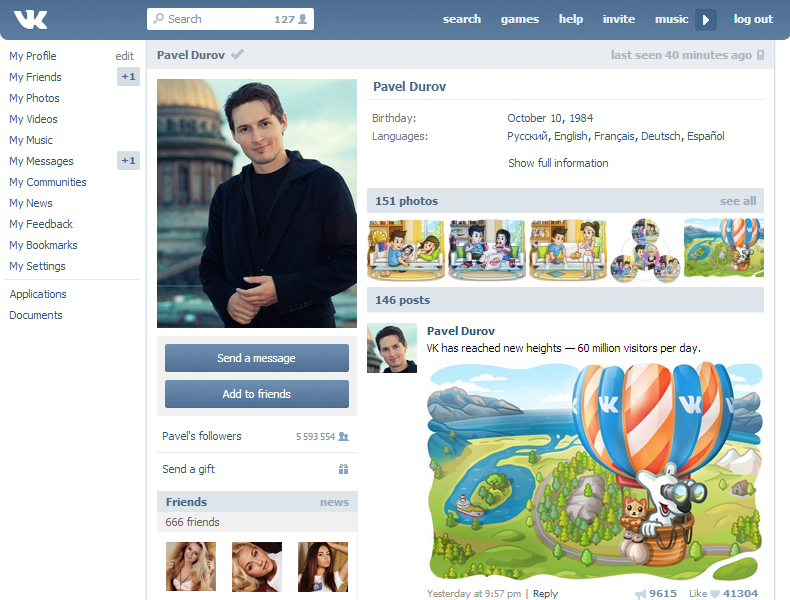 Launched in 2006, VK, formerly known as VKontakte, is a Russia-based social network widely used in Asia and post-Soviet Union countries. The social network looks similar in design to the way Facebook profiles looked in 2010. VK has a large audience, with 60 million users from Ukraine, Russia and Belarus compared to these countries’ combined 12.4 million users on Facebook. With over 80 million monthly active users, VK can attribute some of its popularity to its wide scope of language options. For instance, Russian users can choose between pre-revolutionary and Soviet versions of the network. Brands can advertise on the network. Adidas, Coca-Cola, ZARA and others on VK run verified communities, where users can participate and engage with the brands. Similar to Facebook, brands can highlight the inclusion of influencers and share content, which is often repurposed from previously shared media on other social channels. VK isn’t as regulated on what types of content can be shared on its platform, which has some pros and cons. Less restrictions is the main benefit for a global brand’s advertising efforts, as it allows for more creativity with ad campaigns. Still, this lack of regulation comes with more concerns around pirated and inappropriate content appearing on VK. If your brand is active in Asian markets, it makes sense to consider the social media networks where people in Asia are the most engaged. Start testing these social networks against your existing Instagram, Facebook and Twitter accounts. Make small investments to see where your brand fits in the region’s digital ecosystem. Then, once you’ve collected feedback and compared the data against your mainstream networks, determine whether to invest more heavily on certain channels.